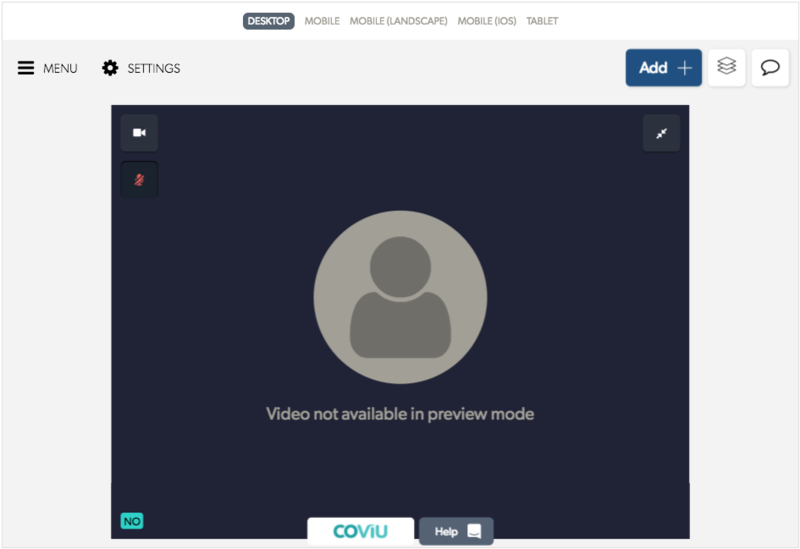 In this article, we will look at how to use the customisation options in Coviu to apply custom branding to the Coviu call interface. Go to 'Team Settings', then select the 'Customisation' tab. The customisation options are the same regardless of whether you are using a Professional, Scale or an API plan. Upon reaching the customisation options screen, you should be presented with a screen resembling the image below. This is the customisation interface, and it allows you to tweak the various styling options available and immediately see how those changes will appear on the call interface. The preview pane on the right. Any changes that are made to the options in the styling pane will immediately be applied to the call interface in the preview pane. The preview pane itself contains a fully operational call interface - while you cannot conduct an actual call from within the preview pane, all the buttons and interactions act exactly the same as they would in an actual call, so you can see exactly how things will appear. 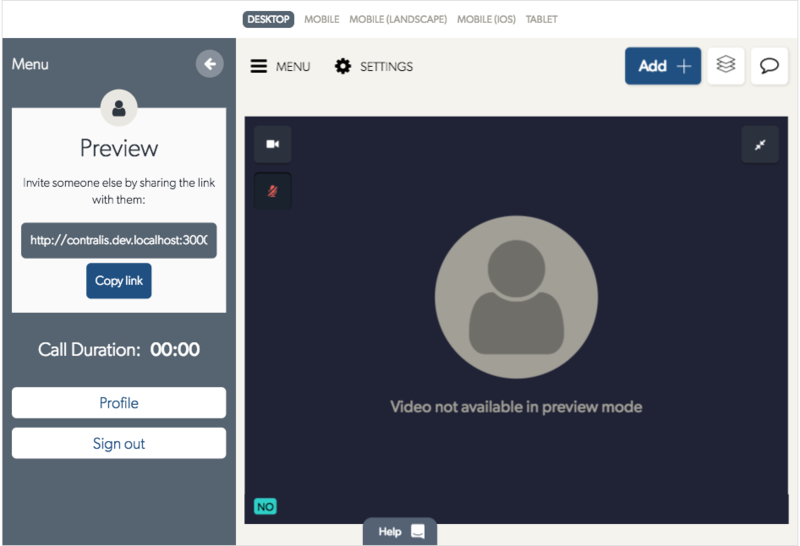 Additionally, using the options available at the top of the preview pane, you can adjust the previewer to display how the call interface will look on different devices. Changing the primary/secondary button colours alters the visual appearance of how certain buttons in the call interface will appear. Primary buttons (such as the Add + and Copy Link buttons) use the primary button colour as the background colour for the button, and the secondary button colour as the text colour. Secondary buttons (such as the Profile and Sign out buttons) use the secondary button colour as the background colour for the button, and the primary button colour for the text. 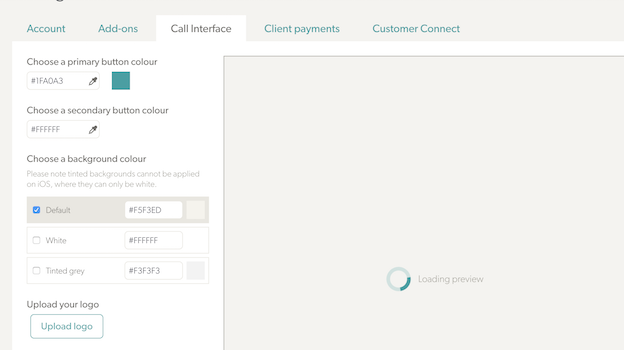 You can choose from a number of different options for the background colour - this applies the colour only to the background of the main call interface. It should be noted that due to implementation constraints that are present on iOS devices (iPhone/iPad), the background selection on an iOS device will always be overridden with a white background. At some point in the future, hopefully this constraint will be removed. You can upload your own brand logo to be displayed within the call interface. Logos are displayed in a 138x36px box at the bottom of the page. If a logo is larger/smaller than the display size, Coviu will automatically resize the logo to it's maximum possible size that retains the default aspect ratio of the logo. The background colour for the logo container is white. If you are using a logo with a background colour that is not white, and you wish to avoid a white border, please ensure that the logo image is 138x36px in size, or can be scaled exactly to that size. This will size your logo to fill the entirety of the logo space, and will leave no white background displayed. Logos can be a maximum of 50KB in size. As you can hopefully see, it is easy to apply some level of customisation to the Coviu interface to help it better fit your purposes. If you find that the options listed in this document are not sufficient in your purposes, please contact us and we'll see what we can do for you.